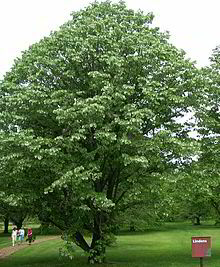 The linden is recommended as an ornamental tree when a mass of foliage or a deep shade is desired. 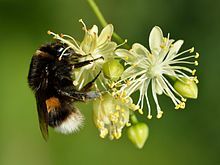 The tree produces fragrant and nectar-producing flowers, and the medicinal herb lime blossom. They are very important honey plants for beekeepers, producing a very pale but richly flavoured monofloral honey. The flowers are also used for herbal teas and tinctures; this kind of use is particularly popular in Europe and also used in North American herbal medicine practices. ^ "Tilia". Natural Resources Conservation Service PLANTS Database. USDA. Retrieved 10 December 2015. ^ Šmid Hribar, Mateja. 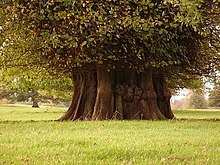 "Najevska lipa" [Najevnik Linden Tree]. In Šmid Hribar, Mateja; Golež, Gregor; Podjed, Dan; Kladnik, Drago; Erhartič, Bojan; Pavlin, Primož; Ines, Jerele (eds.). Enciklopedija naravne in kulturne dediščine na Slovenskem – DEDI [Encyclopedia of Natural and Cultural Heritage in Slovenia] (in Slovenian). Retrieved 28 August 2013. Pigott, Donald (2012). Lime-trees and basswood : a biological monograph of the genus Tilia. Cambridge: Cambridge University Press. ISBN 9780521840545. Wikisource has the text of the 1920 Encyclopedia Americana article Linden. Eichhorn, Markus (January 2012). "Lime Trees and Bees". Test Tube. Brady Haran for the University of Nottingham.